A Shankha is a conch shell of ritual and religious importance in Hinduism and Buddhism. 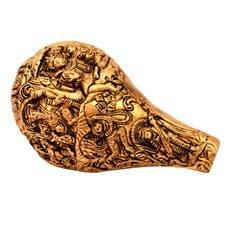 In Hindu mythology, the shankha is a sacred emblem of the Hindu preserver god Vishnu. It is still used as a trumpet in Hindu ritual, and in the past was used as a war trumpet. 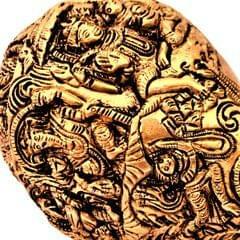 The shankha is praised in Hindu scriptures as a giver of fame, longevity and prosperity, the cleanser of sin and the abode of Lakshmi, who is the goddess of wealth and consort of Vishnu. The shankha is one of the eight auspicious symbols of Buddhism, the Ashtamangala, and represents the pervasive sound of Buddhism. 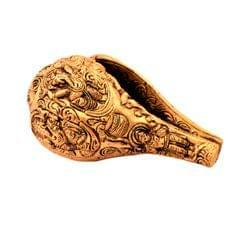 This is a high quality brass shankh depicting various avatars of Lord Ganesha including his parents Shiva & Parvati. The detailed carving captures the essense of the Indian Hindu mythology and its main deities. An truly unique collector's piece.